5/1/2008 This ability triggers when you cast Demigod of Revenge as a spell. It won’t trigger if Demigod of Revenge is put directly onto the battlefield. 5/1/2008 The triggered ability will resolve before Demigod of Revenge will. 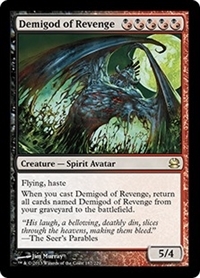 5/1/2008 If Demigod of Revenge is countered *before* its triggered ability resolves, the ability will still resolve. It will return that Demigod of Revenge from your graveyard to the battlefield, as well as any others. If you’re casting a spell to counter Demigod of Revenge, it’s important to clarify you’re casting it *after* the triggered ability resolves if you don’t want that Demigod of Revenge to be put onto the battlefield.